Listed below are our rates and e-mail address. 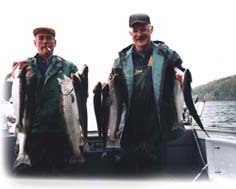 We fish for Lake Trout, Rainbow Trout, Landlocked Salmon, and Brown Trout. We Grand Slam (all four species) about once or twice a season. We trifecta around 50% on a good year. In 2016 it was close to 75%. Here at Eagle Rock, fishing is our way of life. Your Captain, Glenn Quick is licensed by the United States Coast Guard and has been a full-time guide for more than 14 years. Captain Glenn held an IGFA world record for five years and guided a client to one as recently as 1996. Field testing and Pro Staffing the latest gear and tackle from Cortland Line, Flasher and G.P. Spoons. 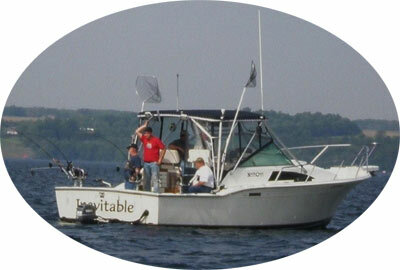 Combining this with a lifetime of fishing experience on Cayuga Lake definitely puts the fish at a disadvantage. The "Inevitable" Our new charter boat. She is a 1991 North Coast Blackfin, 31 foot in length with a 12 ft beam. She is powered by twin 350 hp Crusader engines. Plenty of amenities like a generator with air conditioning, radar, frig ... We have increased the cockpit room by 50%, and will have outriggers to increase the number of lines we can run. The trolling engine will also be added, and a hydraulic ram will control the trolling engine or the main rudders. Steering will be much much better! 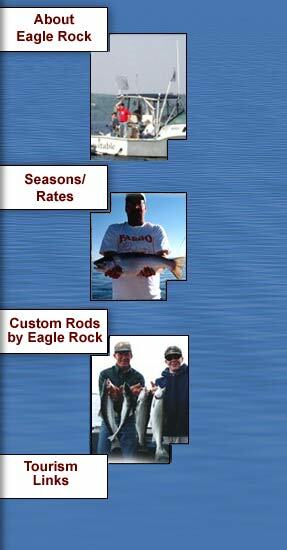 All fishing gear and tackle is provided, including 10.5', custom-made, noodle rods. Your catch, from waters rated AA (suitable for drinking), will be kept on ice and custom cleaned and packaged at the completion of your trip. We even clean your catch on the water so that you get every possible opportunity to land more fish. For example 2 adults and 4 kids still $450.00 for 6 hour trip.